Two-button folding allows independent operation of each side so walker fits through narrow spaces while maintaining rigidity. Easy-to use folding mechanism is ergonomically designed for operation with palm, finger or arm. 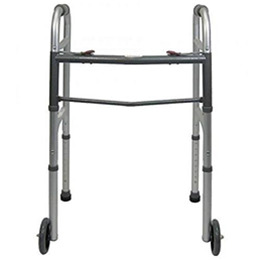 Lightweight one-inch aluminum tubing with dual steel cross bars supports up to 300 lbs. and weighs only 6.75 lbs. Contoured vinyl handgrips enhance user comfort and are easy to clean. Upper and lower spreader bars increase rigidity and make platform attachment easy to attach.